As you can see it has been quite some time since I have posted anything on this blog. Unfortunately, the longer this went on the harder it became to put up another post. I kept thinking I had to find something really good rather than just the same old birds! Then, the other day a friend called and suggested I came round for coffee and we would sit out on her verandah and just see what birds were visible. This is the result. 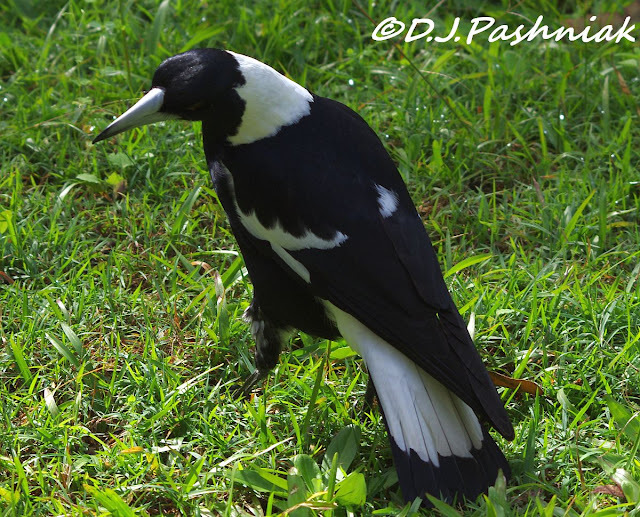 The first birds to come in were a family of Magpies. They were very tame and obviously expected a hand-out if they stayed long enough! 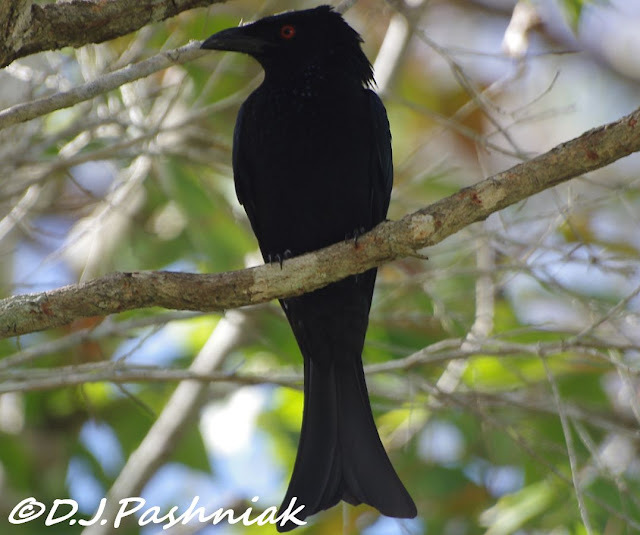 The Spangled Drongo's were the next to show themselves but they stayed high in the trees. and the juvenile still has a slightly brown colored head. 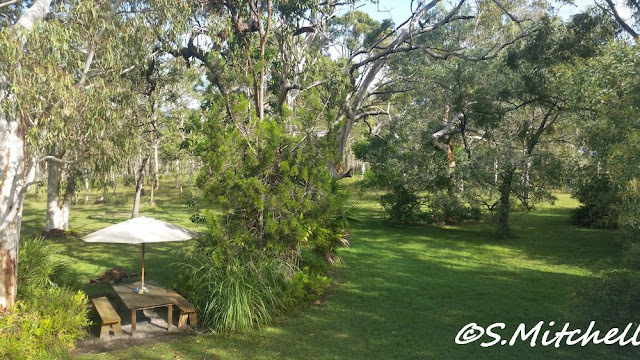 I finished my "cuppa" and then my friends suggested we walk around to their back yard because a couple of Tawny Frogmouths could usually be found somewhere out there. 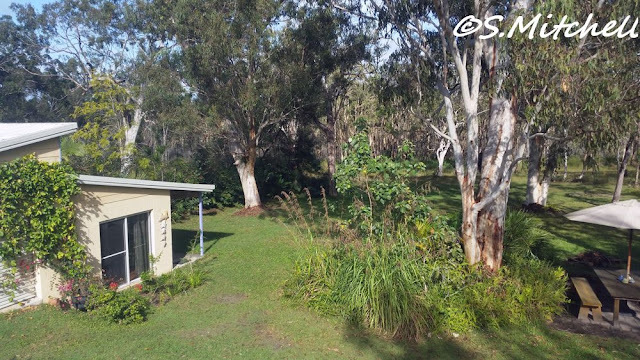 Their backyard is delightful and each time I am around there I take photos to try to capture the space and colours underneath the large gum trees. I have never been completely satisfied with the photos. 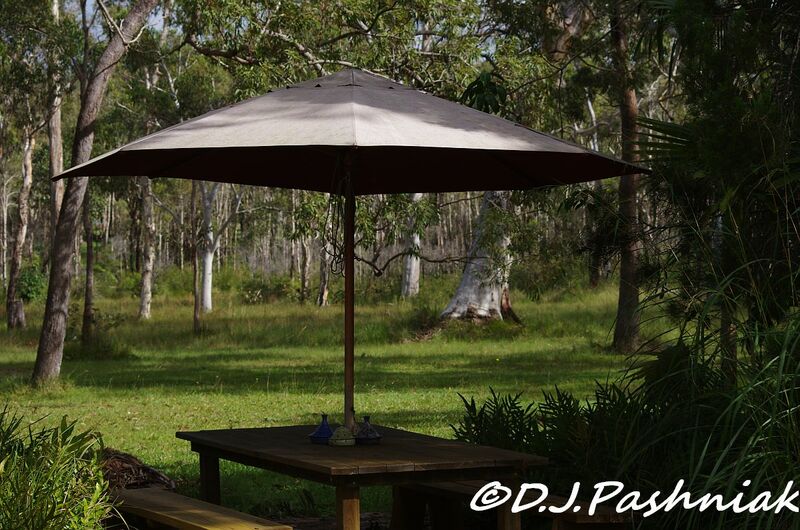 I tried again this time and took this photo showing their outdoor eating area and the view down through the trees. Then Sarah told me she had taken a couple of photos that morning when she had been helping Graham clean off the rubbish which had fallen on the roof during a storm the night before. How good is that! Great photos with a new view of the yard. Sarah's photo of the same place. Sarah is an artist and this is a view of the corner of her studio. Then we found the Tawny Frogmouths. They are never easy to see and the second one was especially well hidden. These were the stars of the show for me! They are active during the night so during the day they sit high up with their eyes closed but usually you can see that there is just a crack where they are obviously watching you. oh, wow! awesome return! love the beautiful magpie and the frogmouth! 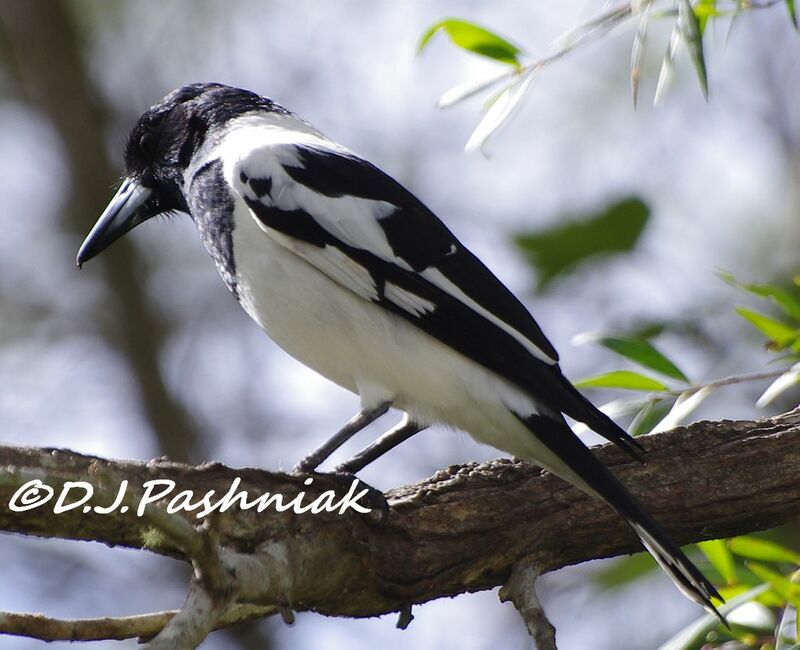 Hello, it is especially nice that you could enjoy these great birds from your friend's home. It must be an awesome habitat for the birds. The Frogmouth is really cool. Great series of photos. Happy Monday, enjoy your new week ahead! Welcome back! 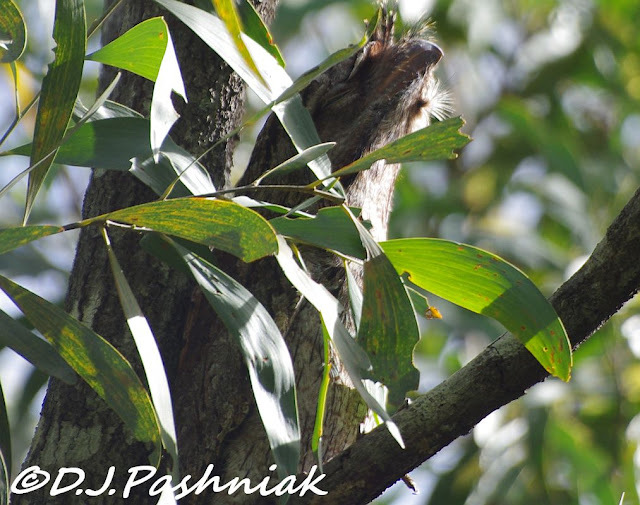 I love those Frogmouths - how unusual and amazing! Great to see you back beautiful photos of all the birds and yard. Welcome back Mick. Don't worry about showing the "same old" birds - they are not to us that liver a few miles away from you. Where else could I see a frogmouth? I'm amazed that you even found them the way they blend in with their surroundings. It would be great if birders could blend in so well wouldn't it? The Tawny Frogmouth is a fascinating looking bird. It is always nice to see and hear about the different wildlife in other countries. Mick, I for one, never tired of your posts. They may have been redundant to you, but each and every post was exceptional for us who visit. 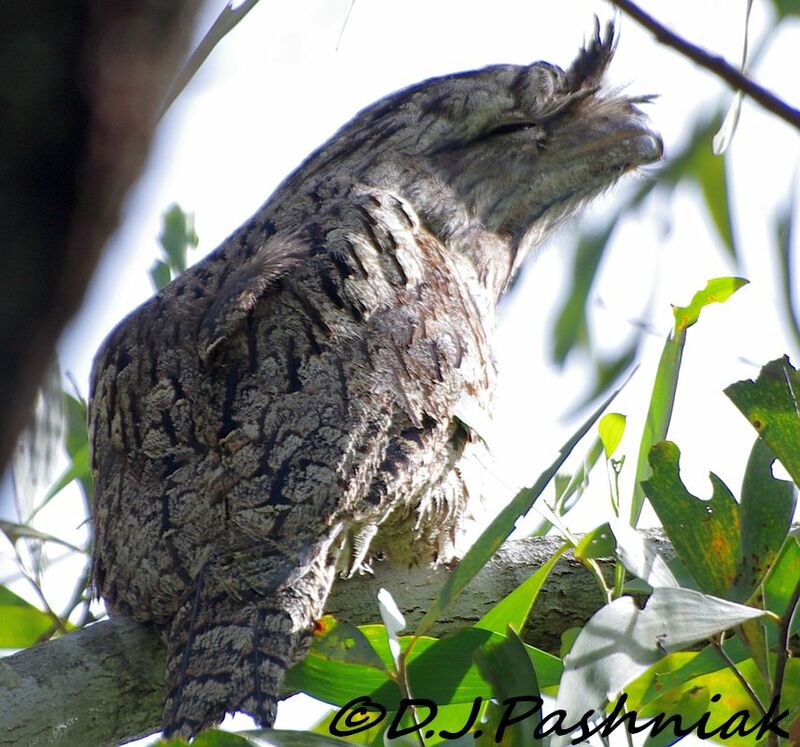 Now that Frogmouth is fabulous as are all of your photographs Mick Thanks for sharing. I am so glad you are back posting your wonderful photos. Each bird you post is rare and exotic to me! 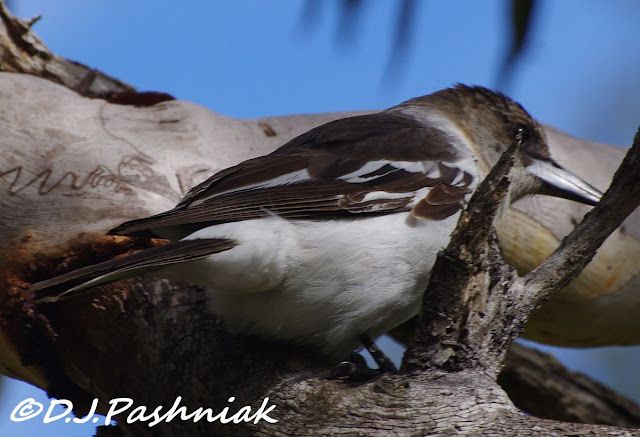 You may see these birds each day but to the rest of us they are fascinating. I love the Frogmouth. cheers and keep on blogging. Welcome back to blogging :) Sometimes, you just have to take what you find and sometimes you find something great. I am impressed with the tawny frogmouths! I've never heard of them or seen them before and they are so cute! Wonderful photos! Your magpies are handsome birds and I love the frogmouths. welcome back. You have been missed. I understand very much how you felt. I am in it pretty much too. Same old bush, and birds? Where are they? I have to find something else to do. I'm having a similar problem...with the heat unbearable, I am not getting out to get any bird photos, and I've not found anything new in quite a while. I hesitate to re-post some old photos, just to have something to post. But, I think we should just do that when we can because I don't think anyone could ever get tired of seeing birds they don't have in their own back yards. Your post today is awesome, by the way! Love that tawny frogmouth! These are great pictures - there are a couple of species there I would love to get better pictures of for myself. Keep posting!